Are you ready to get your summer reading on? In my world, there is nothing better than parking yourself on the patio with a tea (hot or iced) and a good book while the kids run rampant in the yard. It doesn’t happen nearly as often as I’d like, but those few stolen moments on weekends are my bliss. I came across an ingenious book rest / wood bookmark on Pinterest and couldn’t resist – I had to have one for myself. This is another one of those scrap wood projects that I love so much, which means if you have any wood lying around at all, you can probably whip one up for yourself without purchasing a single thing. Set your mitre saw to a 30° angle and cut the other ends so that you have a distinct short side and a long side – see image. Jeesh, wish I’d figured that out before I started this project. Trust me, prototype #1 was a headache and a half trying to figure out angles and possible jig scenarios. WAAAAAY over-thought it. I sanded the sides of my boards that will face the inside of the triangle with 120 and then 220 grit sandpaper – knowing I wouldn’t be able to sand these easily later. Apply some wood glue and clamp until dry. I did use a couple of finishing nails as well, but the wood glue is more than strong enough. You can see that I have a few gaps on my wood bookmark – that’s due to the trial and error of the builder and not the accuracy of the angle measurements. A little wood filler will hide this. I sanded the entire wood book rest with 120 grit and then 220 grit sandpaper and added a slightly chamfered edge by running my sander at a 45° angle along the corners. I don’t know if I’ve mentioned this on the blog before but I HATE angles. I hate calculating them and I hate cutting them (if they are outside of what my mitre saw can handle). I really need to invest in a dollar store protractor or something because clearly I wasn’t paying attention in grade 5 math class. Kids – stay in school if you ever want to build anything. I added a coat of stain and varnish to finish my wood book rest. Time to hit the patio with my fancy-schmancy wood bookmark! The chamfered edges aren’t necessary at all, but I think it gives it just a bit more polish. 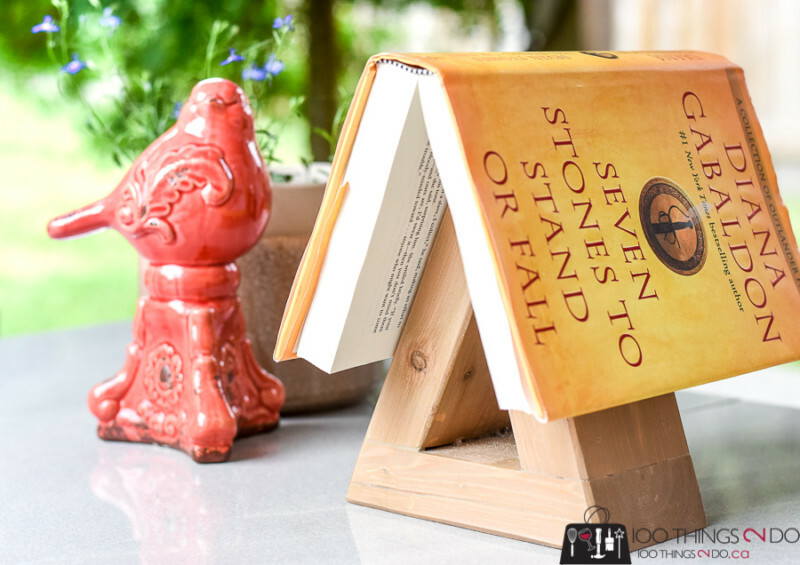 A 2″x6″ would have made a wider base to rest your book on, but this version – made with scrap 2″x 4″ is perfectly functional and just the right size to set on your nightstand (or patio table). The book itself? While I really enjoyed the Outlander series, this series of short stories isn’t as gratifying – there’s just not enough story to get thoroughly involved with the characters. I give it a “Meh”. DIY Barbecue Scraper - 10 minutes and free!